(Greek: σάπφειρος; sappheiros, ‘blue stone’,) is a gemstone variety of the mineral corundum, an aluminium oxide (α-Al2O3). Trace amounts of other elements such as iron, titanium, chromium, copper, or magnesium can give corundum blue, yellow, purple, orange, or a greenish color. It is the second hardest substance on earth after diamond, rating 9 on the Mohs scale of mineral hardness. Corundum itself is not a very rare mineral, but gem quality corundum is extremely rare. Most corundum is opaque to translucent and heavily included, suitable only for industrial use, including the production of abrasives used for sandpaper and machining of metal, plastics and wood. While blue is the most traditional and classic color for sapphire, sapphire is actually found in a variety of different colors. Most natural sapphire is quite pale and light in color. Only a small percentage of natural sapphire exhibits vivid and intense colors without some type of treatment or enhancement, the most common being heat-treatment. For many years, only blue sapphire was recognized as ‘true’ sapphire. 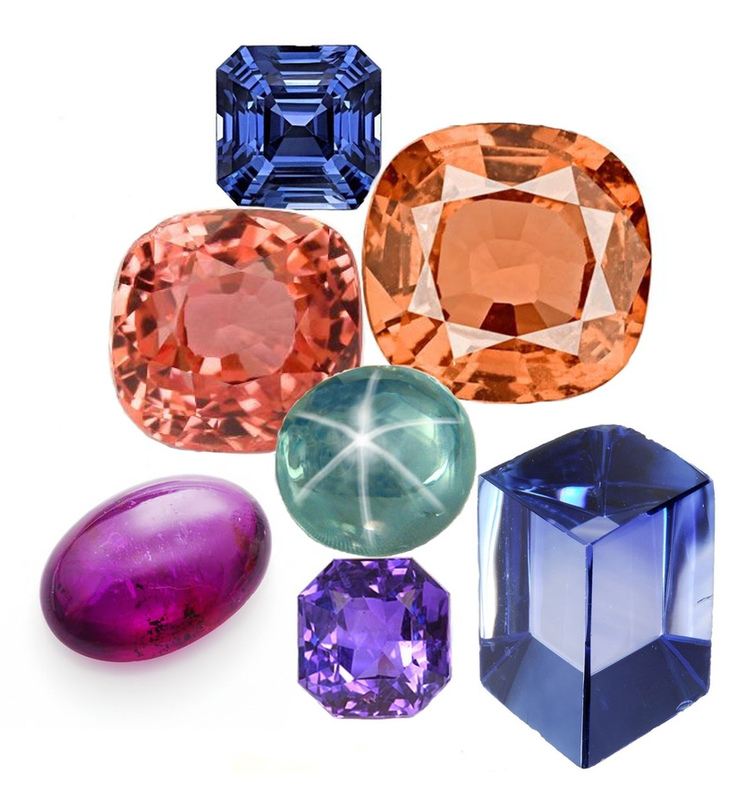 Today, all colors of gem quality corundum are known as sapphire, with exception to red corundum, which is classified as ruby. There is no definitive demarcation between red ruby and sapphire; in most cases, near-red sapphire would be classed as inferior colored ruby. Thus, it is common practice to trade near-red sapphire as a quality fancy color sapphire, rather than as a lower grade ruby. Colored sapphire (other than blue) is often referred to as fancy sapphire, and fancy sapphire is typically traded using color-specific names, such as yellow sapphire, green sapphire or purple sapphire. Sapphire is the birthstone for those who are born in September. As for the zodiac, it is regarded as the stone for Taurus. If a Taurus wears a sapphire, it is thought to protect from and cure mental disorders. Throughout history, sapphire has symbolized truth, sincerity and loyalty. It is also thought to bring peace, joy and wisdom to its wearer. In the past, the sapphire was also believed to be a talisman that would protect against evil spirits and other unsavory creatures of the night. The ancients regarded star sapphires as powerful talismans that could protect travelers and seekers. These talismans were considered to be so powerful, that they would continue protecting the wearer even after they had been passed on to another person. Sapphire can be cleaned using a soft cloth or brush and plain warm soapy water. After wiping, be sure to rinse your sapphire well to remove soapy residue. Sapphire can change color under extreme heat, so avoid extreme temperature fluctuations. Also avoid the use of any harsh household chemicals and cleaners, including bleach or hydrofluoric acid, as chemicals can cause corrosion. Sapphire is quite durable, but it is still recommended to always remove any sapphire jewelry before engaging in vigorous physical activity, especially when exercising or playing sports. When removing jewelry, do not pull from the stone as this can weaken prongs, eventually leading to a lost stone. When storing sapphire gemstones, wrap them in a soft cloth or place them inside a fabric-lined jewelry box.